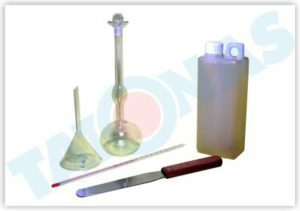 Specific gravity is defined as the ratio of the weights of a given volume of material and weight of an equal volume of water.To determine the specific gravity of cement, kerosene which does not react with cement is used. The le chatliers flask is made of thin glass having a bulb at the bottom.The capacity of the bulb is nearly 250 ml. The bulb is 7.8 cm in mean diameter.The stem is graduated in millimeters.The zero graduation is at a distance of 0.8 cm from the top of the bulb. ro and 1 ml. Record the level of the liquid in the flask as initial reading.Put a weighted quantity of cement into the flask so that level of kerosene rises to about 22 ml mark,care being taken to avoid splashing and to see that cement does not adhere to the sides of the flask above the liquid . After putting all the cement to the flask ,roll the flask gently in an inclined position to expel air until no further air bubbles rises to the surface of the liquid .Note down the new liquid level as final reading. Weight of equal volume of water Volume of cement particles * Specific gravity of water.